Introducing 2019 Cherry Blossom Mini Sessions! 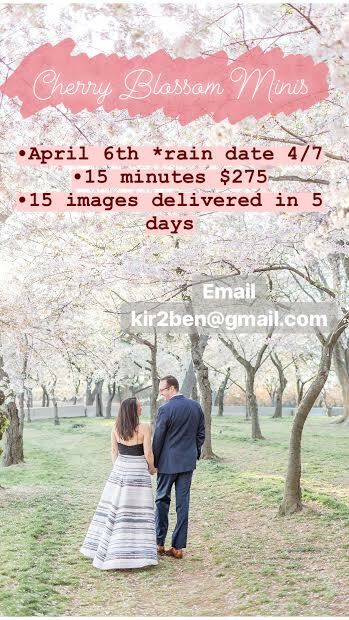 I am happy to announce my first ever Cherry Blossom mini sessions! Is it your first Spring as a married couple or is this your millionth blossom season together and you just want ONE photo of all the kids smiling just once!? I got you covered. You can go formal with a gown & glam up or jump in your jeans and admire the pink blossoms all around! These sessions are quick and natural. Fur babies welcome as well! Images will be ready in 5-7 days! Below are my Blossom images from previous years! APRIL 6 (Rain Date April 7) Hains Point D.C.
Use this link or email kir2ben@gmail.com to reserve your spot!